Investigators present on Night 1 (August 5): Matt from Midwest Preternatural Research, Katie, Keith and Jody from Fox Valley Spirit Hunters, Kurt, Mark, Rhonda and Barry from HPI, Michael from Kettle Moraine Paranormal, and Jaeson Jrakman (www.jaesonjrakman.com). There was also a whole second group that we collaborated with the first night. But they disappeared the second night and didn’t get back to us or the owner with their findings. We don’t know what happened and we’re sorry it didn’t work out. Investigators present on Night 2 (August 6): Matt from Midwest Preternatural Research, Katie, Keith and Jody from Fox Valley Spirit Hunters, Barry from HPI, Michael from Kettle Moraine Paranormal, and Jaeson Jrakman. 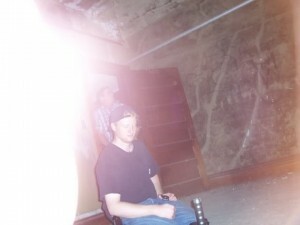 Background: The site is an abandoned Catholic school/church with five run down buildings (the school, the old dorms, the church, the library, and the printing building) and two fixed up buildings (the new dorms and the renaissance building, where we set up our headquarters for the investigation). These were the only two buildings that had electricity. There’s also a cemetery with all priests and the crypt of the founder of St. Nazianz, Father Oschwald, and an underground tunnel system. DO NOT go there without permission! You’ll be arrested and fined $5,000 for breaking and entering, NOT for trespassing which is a lesser offense. 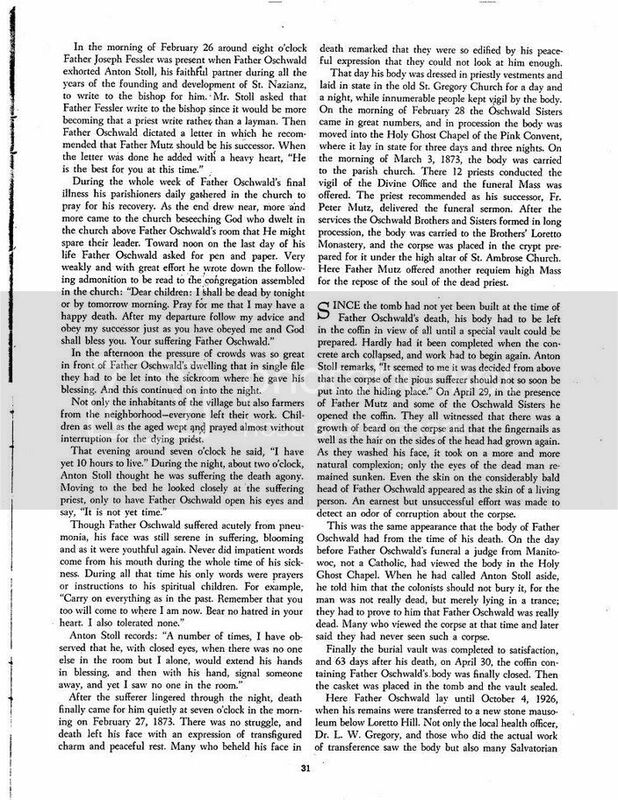 Father Oschwald was dying and could have just been delirious, not seeing ghosts. 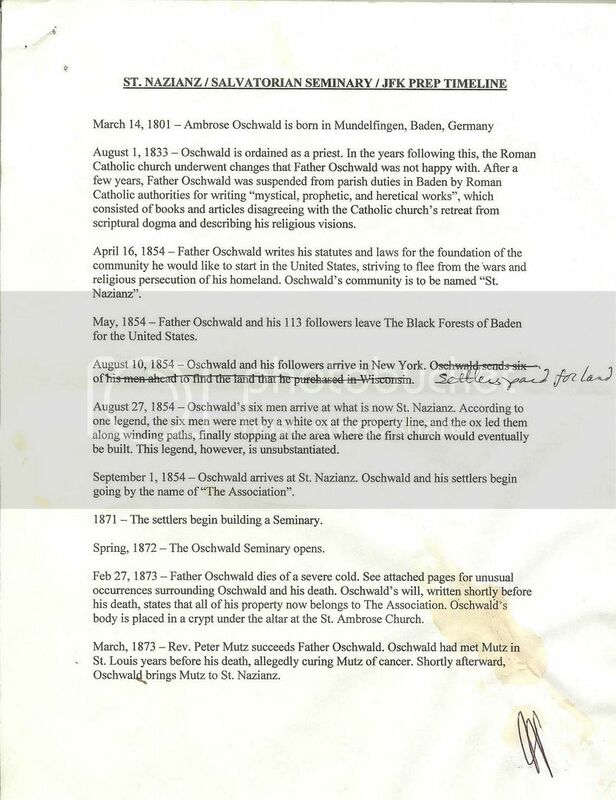 It is strange that Father Oschwald’s body didn’t decompose for all those years. This is supposed to be a saint thing. Lenin’s body doesn’t decompose either, but his body is preserved by biochemists using chemicals. And it is taken in to a laboratory every 18 months. According to the Russian doctor who not too long ago did a makeover on Lenin’s corpse, “He looked terrible when he died, but what you see now is Lenin’s face, not someone else’s.” In Moscow, “mausoleumists” earn most of their money by preserving the bodies of dead mafia bosses. In 1970, the staff secretly embalmed the body of Ho Chi Minh that was on display in Hanoi. 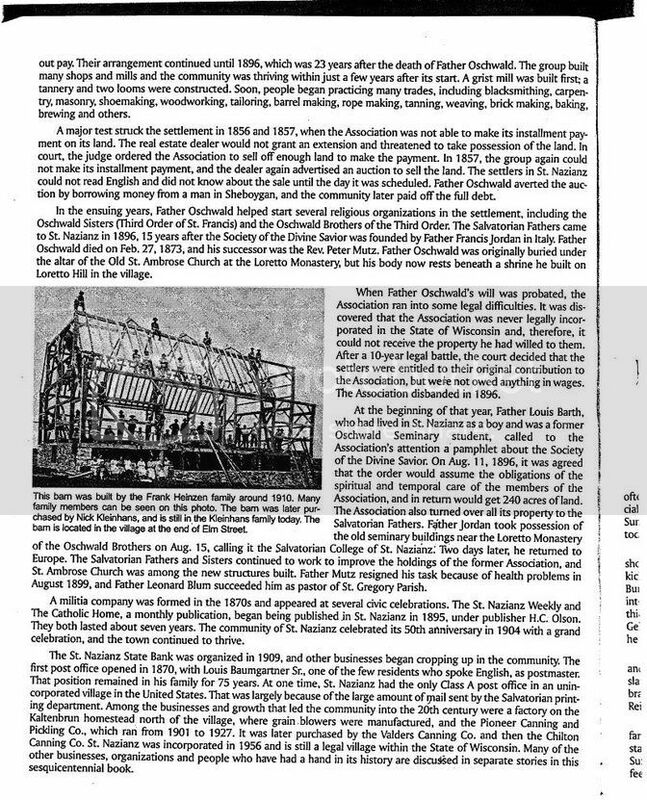 I’m not saying there were hoaxers at work on Father Oschwald’s body, as the then-untested chemical process used on Lenin was developed in 1924 and Oschwald died in 1873. And even if somehow somebody could get into the vault and sneak out Oschwald’s body once every year and a half without anybody noticing, the process used on Lenin takes 30 days. But it makes you think if there could be a scientific explanation. 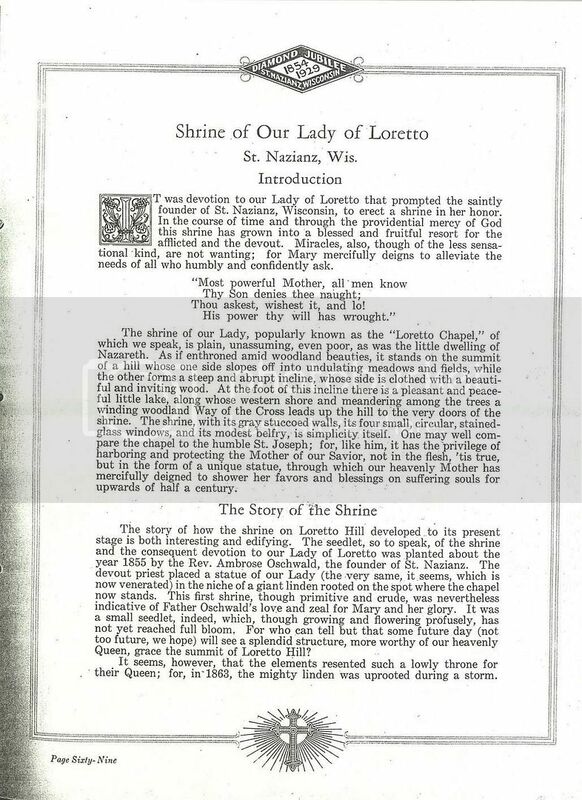 Popular legend has it that Father Oschwald was evil and he cursed the town of St. Nazianz because the State took the land away in 1896, and that’s how the haunting started. 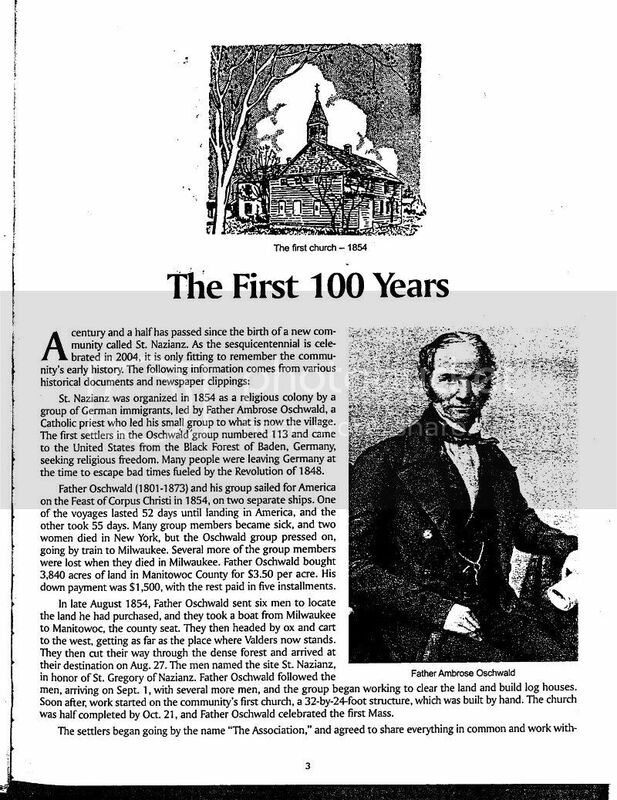 But Father Oschwald died in 1873. The land was taken away twenty years after Oschwald’s death. He couldn’t have cursed it. But this, again, was not because he was EVIL. This can be explained by a phenomenon called Recurrent Spontaneous Psychokinesis (RSPK). RSPK is an unconscious form of Psychokinesis. Sometimes when a person is in physical or emotional pain, or just under a lot of stress, they can unconsciously make their own bed shake or make knocking sounds on the walls, because they’re rebelling on a subconscious level. If you have a lot of stress or trauma in your life, it can continue and it can follow you from house to house until you solve the emotional problem that’s causing it. Another term for this is a “poltergeist” — poltergeists really don’t have anything to do with ghosts, despite what you’ve seen in movies. The only thing the “Poltergeist” movies got right is it’s typically a young girl going through puberty who’s causing it, but not always. 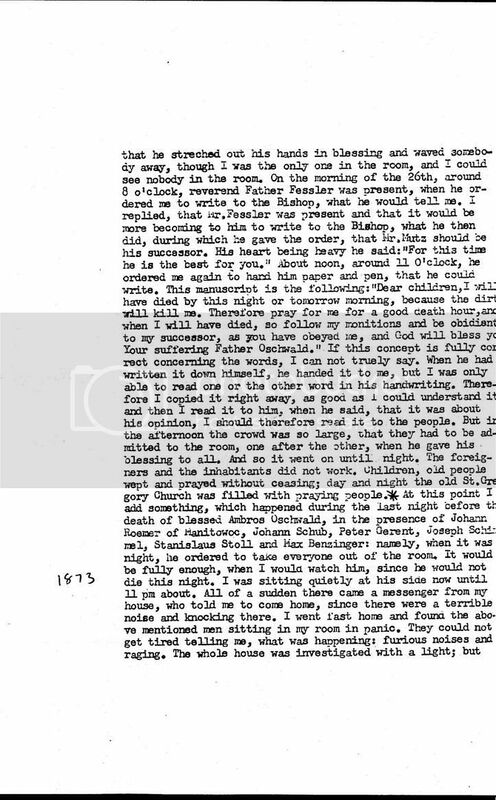 Father Oschwald was not lashing out on the town, he was just dying and in a lot of pain, and he was psychokinetically pounding on the doors and walls all over town because he wanted the pain to stop. He didn’t even know he was doing it. The whole town is not haunted. 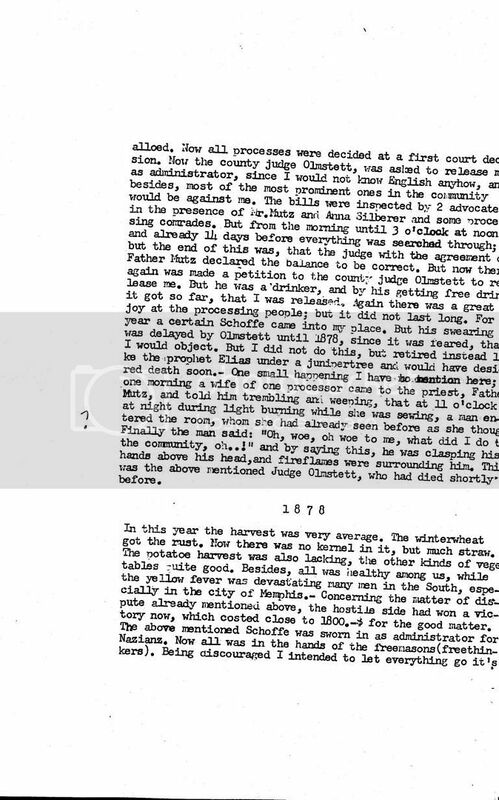 There is nothing to support that but 100-year-old personal experiences, and in most of the cases there was only one witness so it could have been a hallucination or an outright lie. How do you interview someone who’s been dead for 100 years? Even if the witness was credible and *believed* what they were seeing, there still could be a psychological explanation. Of course, you could argue it the other way too and say you can’t disprove it either, because it happened 100 years ago. But I think if you make a trip to St. Nazianz, all you’ll find is a regular town and regular people, not the frightened townsfolk of Blair, Maryland. EVERYTHING about this place was exaggerated. 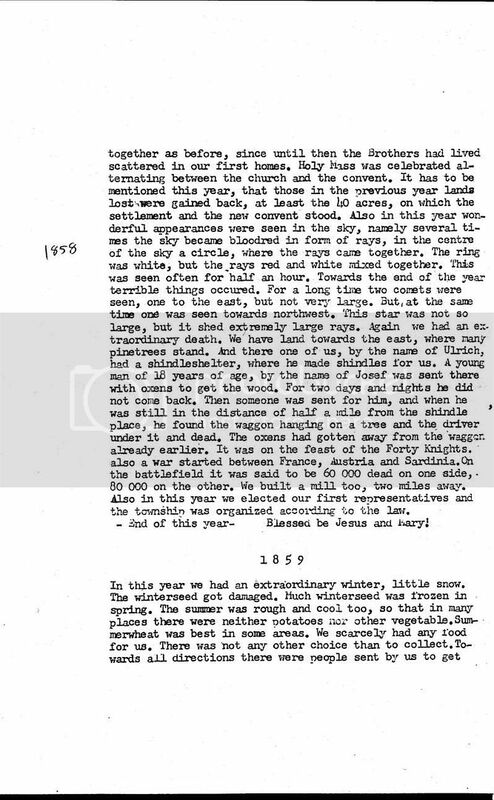 Also, some of those stories, like the boy riding a deer with a superlarge horn and throwing fireballs everywhere he went, allegedly happened when Oschwald was still alive and still had the land, before the land was supposed to have been cursed. So then how did JFK Prep become haunted? There are stories of physical and sexual abuse at the school as to the origin of the haunting, however we couldn’t back that up either. In fact, there’s one urban legend about a student who hung herself from the basketball hoop in the gym after being beaten and molested by a nun. There really was a girl who hung herself on campus, but it didn’t happen in the gym and it had nothing to do with a nun or a beating. I know this for a fact because I was emailed by the girl’s old roommate. I was given her name, a little bit about her, and why she did it. I’ve since received emails from other people who went to school at Prep, including another one of her friends who was able to confirm it, the room she did it in, and even shared her suicide note with me. She had been over to the girl’s house and was able to tell me about what her family was like and who they were. Out of respect for the student and her family I won’t post what building she did it in or what her reason was. 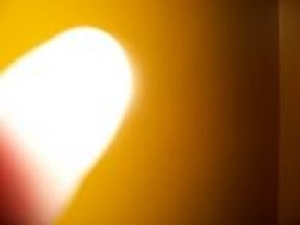 We got a few EVPs that sound like it’s saying “burning”. Maybe the haunting is because of the great fire in 1871 where all those people died. The fact is neither we, nor anybody else, knows for a FACT how the haunting originated. I think in a place like this with so much history, there’s just bound to be something. There could be residual energy from all the students that passed through here. 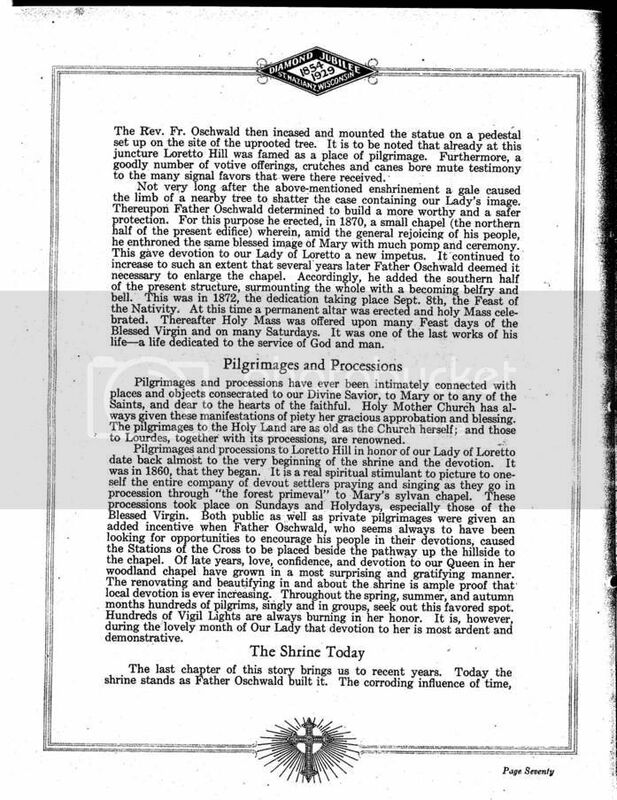 But on our investigation we also had a few occurrences that would imply an intelligent style haunting. Maybe there’s a little of both. 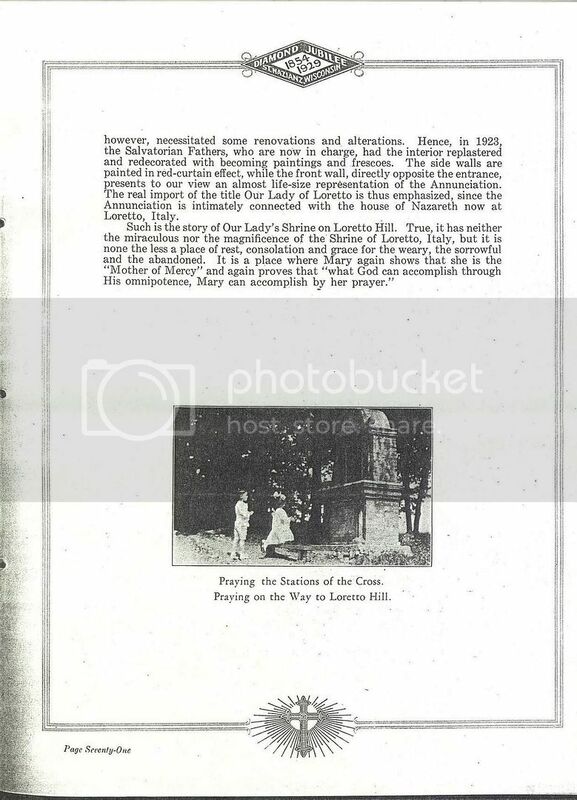 Another urban legend is that the graves in the cemetery up on Loretto Hill, where Father Oschwald’s crypt is and where all the priests are buried, alternately rise and sink. They do not. And the cemetery is actually still used, as some of the graves were new. You’re supposed to be able to hear students laughing in the halls of the school. Actually, we found the school to be the least active of the buildings. The one time we did hear footsteps above us on one of our subsequent visits, it turned out to be *living people* who were caught trespassing. Our Investigation: Katie, Keith, Michael, Barry and I arrived at 3PM and spent the afternoon just walking through the buildings and thinking about how we were going to set up. On the initial walkthrough back in May, the owner only had time to show us through two of the seven buildings and the cemetery. The plan was to spend the afternoon taking some base readings with our EMF meters, mapping out the buildings, and doing some control audio recordings with nobody in the buildings. But the place is so big that we didn’t get done and had to get going on our investigation. However, we were able to do more on our follow up. The rest of the group arrived later, and we started the investigation at 8:00PM. We split up into three groups. Jaeson was the zone leader for Group 1. There were six people in that group including Jaeson and myself, and there was an EMT in case anybody got hurt. Barry was the zone leader for Group 2 and there were five people in that group including her. She had one EMT in her group, just in case. Michael was zone leader for Group 3 and there were six people in his group including himself. Michael has medical training and he’s a psychic. Then we also had someone stay in headquarters all night and monitor Michael’s live video feed on a laptop. The three groups communicated by walkie-talkie and were assigned to separate buildings. Jaeson’s group investigated the school building first. We did a sweep of the building, then set up a video camera and Trifield Natural EMF Meter in the only hallway where the owner left a power strip for us. (The buildings have no electricity.) We put motion detectors around the camera so that nobody could tamper with it, then we left the building and sat outside. (You can’t walk around with the Trifield Natural Meter because it’s so sensitive it can detect the nerve impulses in your body when you move. But it’s also one of the best EMF meters you can get for that same reason.) Since there was one group in each building that first night (but not in the printing building which the owner didn’t let us in to until the second night, and not in the two fixed-up buildings, which we didn’t investigate), we had to just sit and wait for the end of the rotation because we had no place else to go. Jaeson admitted to me that there were just too many people (the owner also kept going back and forth between the groups to see how we were doing) and this wasn’t his normal ghost hunting method. The second night and follow-up investigation were more high quality experiences where we had smaller and fewer groups, and we had impressed the owner enough with our professionalism the first night that he let us have the place all to ourselves to do with what we wanted in our subsequent visits. Barry’s group, meanwhile, was investigating the cemetery, church, library, and basements underneath (that was all one zone…it was a lot smaller than it sounds). Barry said in between rotations that it was pretty dead and uneventful. But yes it *could* have just been somebody clearing their throat and nobody remembered to comment. That’s the thing is there’s no way to be 100% sure because nobody was videotaping the EVP circle. Another possibility is thought projection. Someone could have been thinking that answer subconsciously and projected it onto the voice recorder. What do you think it was? Michael’s group, meanwhile, was investigating the old dorms. Michael said he felt drawn to a room on the fourth floor that became known to us as “the suitcase room”. There are a pair of old suitcases lying on the floor in this room that someone must have discarded. One of the suitcases was all the way open. Due to weathering of the item, it couldn’t be completely shut tight. Michael kicked it closed with his left foot. When he came back, it was re-opened, all the way, and back to its original position. Michael said he assumed someone else opened it, so he kicked it closed again, and turned around. He was standing outside, in front of the stairs, and when he turned around it was open again. He said that’s when he seriously started to question it. The first time, someone could have been playing with him. But the second time no one went past him. Michael forcibly closed the suitcase, so you may think it was just returning to its natural state of being partially open but opened all the way. Possibly — but it was only open a couple of inches in the first place and it was also pretty decrepit. In our return visit, we were unsuccessful when we tried to get it to open like that again. After it opened the second time, Michael took his pocket knife and cut away the liner a bit and he checked it well over for any electrical device, and found nothing. But we didn’t get it on video, and upon further inspection Michael says they didn’t note any temperature oddities or get any EMF readings. So we can’t present it as evidence to anyone. We can only give it as a personal experience. After the first rotation ended, we met back in headquarters for an hour break, and I took a head count to make sure we still had everybody. While we were eating, Michael excitedly talked about how it went in the old dorms. Barry’s group was assigned to the old dorms next, and she was intrigued by Michael’s story and asked me if it would be okay to have her group and Jaeson’s group investigate the dorms together so we could have cameras on all floors. I was intrigued also, so I said let’s try it. 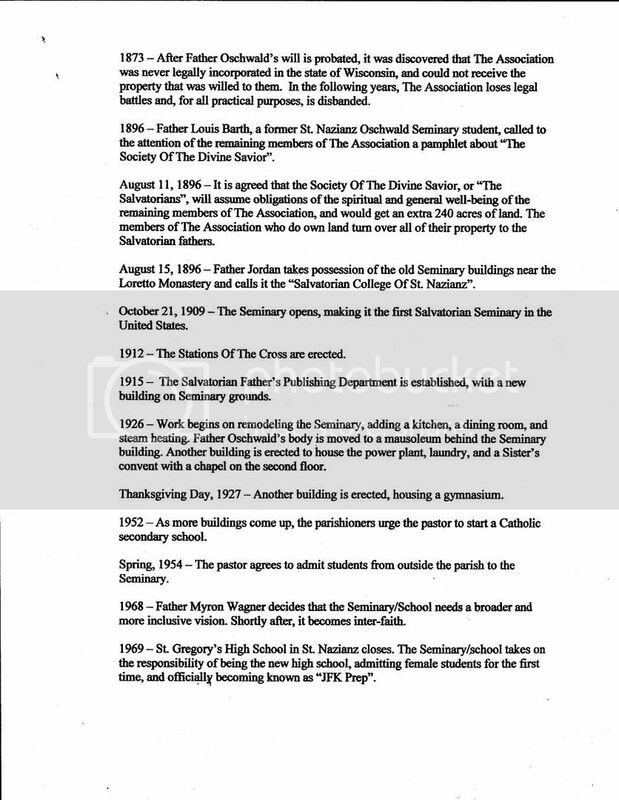 So Jaeson’s group and Barry’s group went up to the old dorms together, and Michael’s group went to the school building. But it was dead now, and there were way too many people now in the old dorms, so Jaeson just left his camera and some of his equipment so they could have it, and we left to go investigate the church. 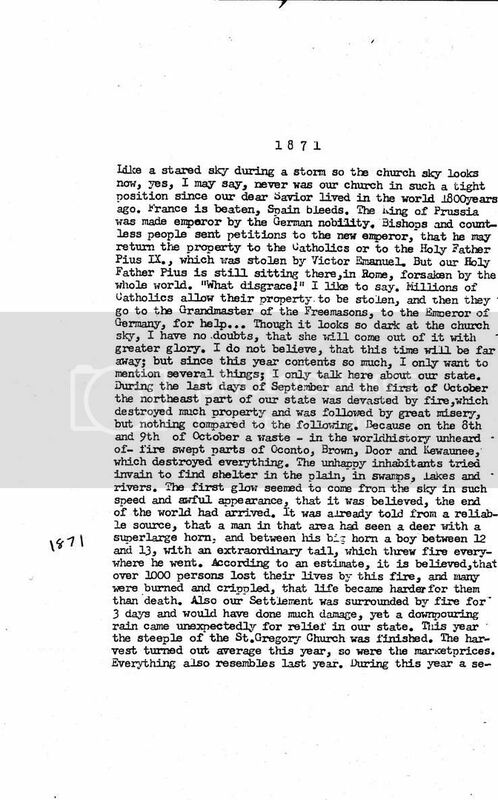 Meanwhile, the church/library/basement were also dead. We did a sweep, and just took some pictures and recorded for EVPs. Then we went up to the cemetery, but it was really peaceful there. On our way back from the cemetery, that’s when we saw Michael’s group up on the roof of the school with their flashlights. They radioed us to come and help, and we did. They had been taking pictures from the roof, and these huge red mists were showing up in some of their pictures. On our follow up investigation we debunked these as the result of heated air rising up from a very large bonfire 100 feet away. I would like to go back and investigate that tunnel – we really only poked our heads in. We called it a night early at about 4AM and drove home or back to our hotel rooms. For me, my first night at JFK Prep was pretty uneventful and disappointing. 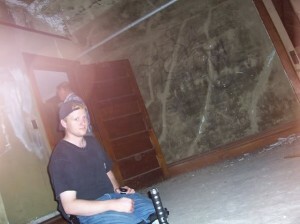 (It wasn’t until we reviewed our evidence that I heard Mark’s possible EVP that I posted earlier.) I went home thinking “it’s not haunted, that was very peaceful” and “if this place isn’t haunted, what is? Am I wasting my time and money being a ghost hunter?” I wasn’t ecstatic about spending a whole second night in a row. We met back at 7PM. The owner opened up the printing building and underground tunnel for us (which just leads from the garage into the printing building), and we did a walkthrough. He also opened up this little yellow barn for us next to the renaissance building, if we wanted to go in there. We started our investigation again at 8PM, with a much smaller group. Kurt wasn’t able to come back the second night, but let me know a month in advance that he could only stay one night. And Mark and Rhonda had kids at home so they couldn’t stay two nights either, so they drove down to tell me this in person and then Barry just walked them through the buildings they hadn’t got to see yet, then they went home. So the second night we only had seven people – the three zone leaders, and Katie, Keith, Jody, and me. With the fewer people, there was no rotation schedule. You just worked with who you wanted and investigated what you wanted, and I kept track of where everybody was on walkie-talkies. 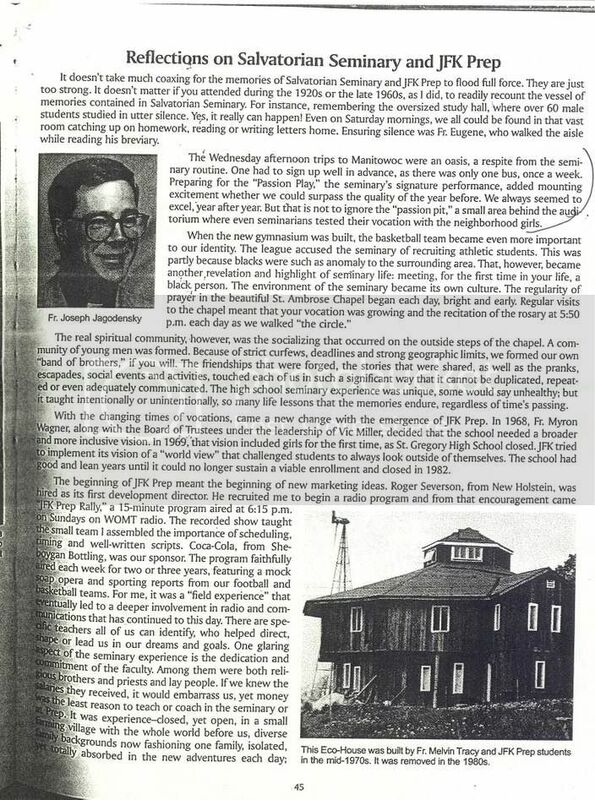 Barry, Katie, Keith, and Jody started in the church, and Michael, Jaeson, and I headed straight for the old dorms. Michael showed Jaeson and me around the old dorms and he showed us the “suitcase room”. Also on the fourth floor across the hall from the “suitcase room” is the alleged Satan Room where, according to urban legend, the founder of St. Nazianz, Father Oschwald, or just a regular priest had an encounter with Satan and then the room was boarded up to protect the students and faculty. The Satan Room is a dud, no surprise. It’s not boarded up, and we never experienced a thing in there. It’s just a room. 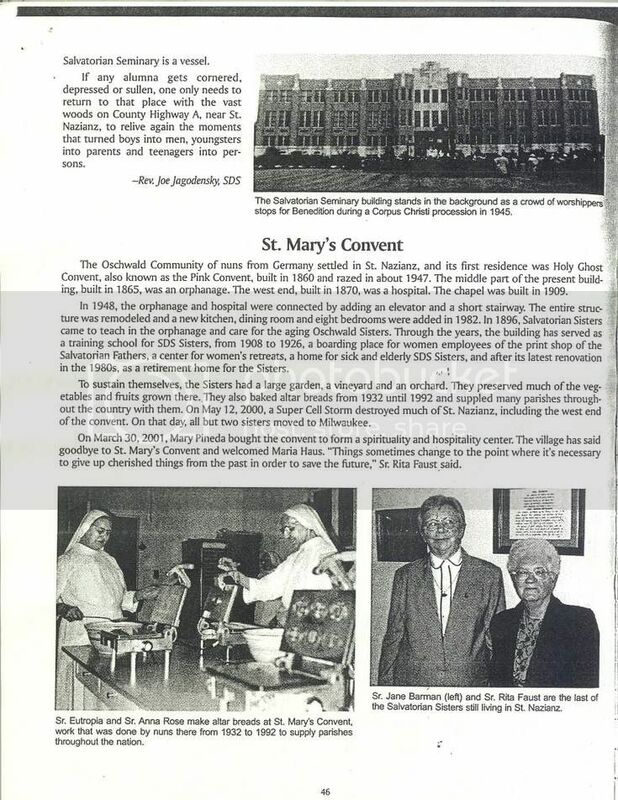 Father Oschwald could not have had an encounter with Satan or anything in that room because the school was built 100 years after Father Oschwald’s time. 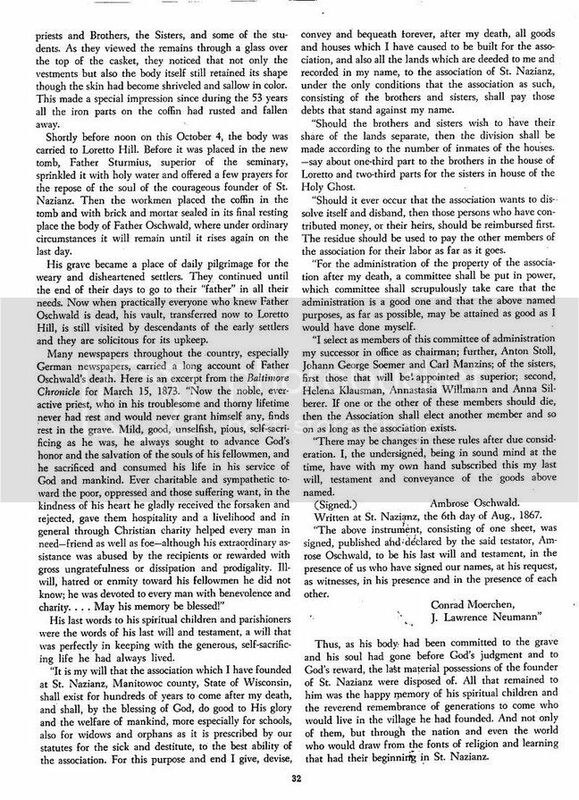 IF there’s even any truth to the story, it had to have been just a regular priest, and he could have just seen a regular ghost or residual energy and then it got blown out of proportion. We set up a video camera and voice recorder in the “suitcase room”, and we put motion detectors at the stairs on the third and fourth floors. I left my voice recorder in a closet on the fourth floor. Then we went down to the third floor and just sat quietly in the hallway and waited for something to happen. Around the same time that Michael had the experience with the suitcase the first night, the motion detectors started going off all over the place. We got up and walked toward the stairs to see if we could see what was setting them off. Bats? There were bats in that building. The other thing to keep in mind is motion detectors are REAL sensitive. Jaeson was walking with his Trifield Standard EMF Meter (the one you CAN walk around with) when his needle went crazy. Then I saw a door open right after that. A door opening can be recreated very easily, if it’s not shut tight, and it wasn’t. The wood expanding can cause it to swing open. It may still be worth noting that it happened right after the EMF spike, but it doesn’t prove anything. But because the motion detectors were going off, we radioed the others to come. A little while after that, things got dead again. Jaeson and Barry left for the printing building. Katie, Keith, and Jody left for the cemetery. Michael and me stayed in the dorms for a little while longer and then left to go back to base for a short break. Then we went to investigate the little yellow barn that the owner had opened up for us. The owner said he had heard stories of cult activity in that barn from long before, and was curious if we would find anything in there. 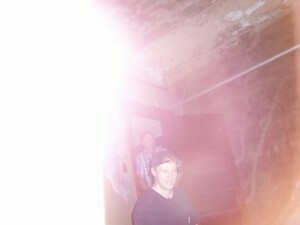 Michael and me set up motion detectors at the entrances, then explored it by ourselves while taking some pictures and asking questions for EVP. There was nothing in there, and in the subsequent times I’ve been back I never came up with anything in that barn or even got a creepy feeling. Michael and me then left to meet Jaeson and Barry in the printing building. We stayed together and stopped to do EVP circles in all the big rooms and took lots of pictures. Next we moved back into the school and walked around the tunnels where I believe Michael thought he’d seen a shadow the night before (stopping in all the big rooms to do EVP circles and taking pictures and readings with the EMF meter), then through the locker rooms, then through the cafeteria directly under the gym, and then up into the gym. After we left the gym we decided to walk the perimeter of the grounds because there were also stories of ghost sightings in the surrounding woods. We didn’t experience anything, and in fact we only got as far as the cemetery. It was now about 2:30 in the morning, my voice recorder was full again, and we’d spent about 15 hours total investigating so far. We’d also been up till 4 in the morning the night before. We were all getting tired, and were ready to go home early. Everybody was back in the renaissance building again and starting to pack up. Michael and I wanted to go up to the old dorms one last time before going home. We went alone, and when we entered we went straight up the stairs to the fourth floor. We went back out to the parking lot where everybody was getting ready to go home and go to sleep, and I think it was Barry who got us all to stick it through to the end of the night. Barry kept trying to re-create a white image and form like the one seen in the shots with Michael, but after many shots of her fingers and of the side of the chair, she still can’t find anything she can use to dismiss those shots – the closest she can get is holding her finger a good three or four inches out in front of the camera lens, which is very tricky and awkward to do and not a natural position to snap pictures in, but even then the base and sometimes the tip of her finger glows a pink/red and not a solid white. However, it *does* look very similar. I think it’s too hard to be 100% sure. Barry showed us these pictures in the view finder right away after they were taken. Then she wanted to get back to headquarters right away and put these on her computer before she pushed a wrong button and erased them or something. So we left the suitcase room and made our way out. When we got to the second story landing, Michael said he heard a dog growl but nobody else did. We went to investigate, and we entered into a little chapel with a balcony over it where you can look down from the third floor where we had come. Michael said there was something watching us from the balcony. We snapped some pictures and asked some questions, but got nothing. After returning to the renaissance building and putting the pictures on Barry’s labtop and showing them to the owner, we of course went back to the “suitcase room” again. The activity was getting hotter and hotter every time went back, and this time we were expecting a full body apparition. We stayed until dawn, but nothing more happened. Michael said he sensed it was annoyed and we were taking over its space, so it had gone downstairs. We left the building, shook hands with everyone, and there ended our first investigation of JFK Prep. Investigators present: Matt from Midwest Preternatural Research, Katie, Keith and Jody from Fox Valley Spirit Hunters, and Kurt and Mark from HPI. We did a follow-up a couple months later on October 8th. Without nearly as many people this time, we broke up into small groups and split up over the campus to try to recreate some of what we had experienced on the first visit. We also just wanted to get in and do some more investigating, and try new things. Katie, Keith, and Jody were in a group together, and they headed over to the church. Katie had brought a CD player along to introduce music in the church and see if that would get a reaction, but it refused to work (she admits she was already having problems with it before she left home). So instead, she thought she would just sing in the church to see what would happen. In the clip, Mark and Kurt are sitting quietly when you hear something start to play an electronic version of “We Wish You A Merry Christmas”. Mark asks Kurt if that’s his cell phone, and he tells him that it isn’t. After taking *everything* out of his pockets (recorder, digital camera, walkie talkie, etc…), Kurt finally takes out his cell phone, and realizes that the sound actually *IS* coming from his phone. What makes this so unusual is, Kurt says that song isn’t anywhere on his cell phone. He says he knows what ringtones he has, and he knows what sounds are on his phone, and he can say with 100% certainty that “We Wish You A Merry Christmas” is *not* anywhere on there. 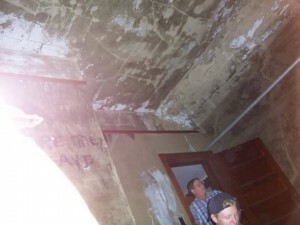 And add to this the fact that it happened in the building that we seemed to catch most of our paranormal activity in. Other electronic equipment has been known to act a little strange in this building, too. 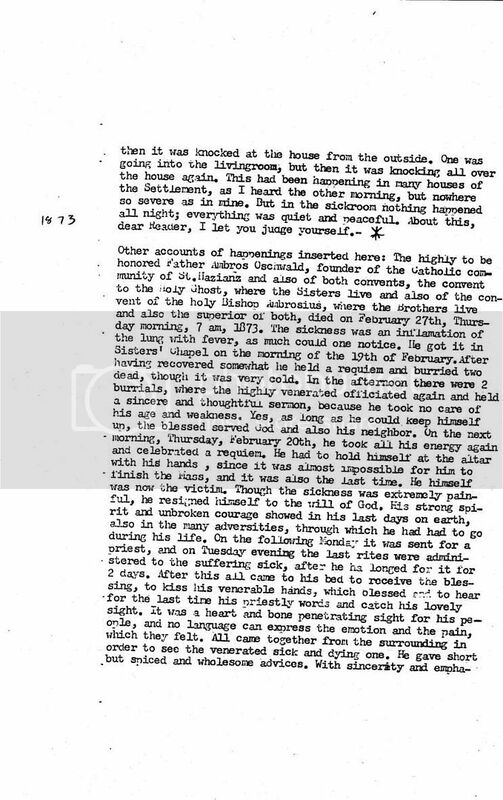 Kurt also says that the sound plays at a much lower volume than his ringtones and other sounds do, and the sound seemed to be coming not from the speaker, but more from actually somewhere inside the phone. When he hit a button on the phone, the song stopped. He says he has no explanation for this. His phone isn’t very advanced, so there is no way that someone could send him the sound without him knowing. It could have been a glitch in the system, or some kind of hidden “Easter Egg” on the phone, but why would it play THAT song in October? He says that honestly he didn’t put much thought into it at the time, passing it off more or less as a glitch. When they got back to the main building, however, and Katie told him how they had been singing Christmas carols in the church not too long before this happened, it really made him wonder. Was it a glitch, a strange coincidence, or something else? Recorded May 1, 2005 by Katie. Katie’s camera has failed and as she is fussing with it, this came through. The person she’s talking to is the owner. It could be a human whisper, but why would someone say THIS in the vicinity of a client? FINAL ANALYSIS: There aren’t ghosts in white sheets rattling chains at JFK Prep, but based on our findings I think *something* is going on there. But it’s also exaggerated (about 90% of the time we were there nothing was happening), and a lot of the stories are nonsense, like the town being cursed and Father Oschwald being evil. I don’t believe the place is evil or demonic or that there’s anything dangerous there. Most of the time it just felt peaceful. I think there’s a lot of imagination and psychology involved. I think if you go in to a big spooky place like this shivering with fear and anticipating being possessed by evil spirits, in your *head* you’re going to get an attachment and be followed home. The couple of people that I’ve met who claim that they were followed around by something while they were here were all people who were quivering with fear before they even set foot on the grounds. I think it’s in your head. Go in with a level head, and nothing can hurt you. Also, a lot of the stories about JFK Prep that you can find on the internet were written by teenagers and young kids who were trespassing, and I wouldn’t give them much credibility because they were after all just after a cheap thrill.